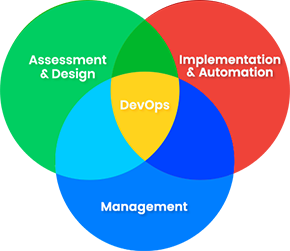 DevOps integrates developments and operations teams in order to improve collaboration and productivity by automating infrastructure, automating workflows and continuously measuring application performance. We can help your company automate and monitor environments with an arsenal of DevOps tools for infrastructure automation, Continuous Integration/Continuous Delivery (CI/CD), source control, monitoring, log aggregation and cloud integration. Our experienced DevOps specialists work with your software development, IT and business teams to understand your business and develop a strategic roadmap to accomplish your goals faster!